I just can't seem to figure this thing out. I'm not used to that. Teaching, leading, watching, moderating... 5th and 6th grade Thrive may kill me. And the thing is I've taught these grades before. I used to have a class of 12 every week, by myself. The thing I don't understand is what I need to be doing differently. It's not that the kids aren't having fun because I'm pretty sure most of them are. The problem is almost nothing that I plan works correctly. Tonight for instance. I got there tonight and immediately had to relocate the entire classroom. During the coarse of the night I realized that there was no air in my room, no trash can, no pens, no paper towels, and no cups. Kind of reminded me of when I first moved out of my parents house into my own apartment and realized I didn't have toilette paper. Don't ask. Then the PS2 that I brought wouldn't work. So, we played a game (the non-video type). Problem is, the kids kept cheating so we had to quit. The blindfolded relay race worked, kind of. It took about 10 times longer than I expected but it did work. The snacks kind of worked except we had no cups. One of the kids located some bottled water for us because like I said, there's no air up there and it is really, really hot. The quiz worksheets worked. They worked last week too so I know those are a keeper. The class discussion worked for the most part. I had good notes to use but I just couldn't figure out how to use them. So, anyhow, I'm an optimist, I'll get this thing running smoothly or die trying. Next week I will try something different. If however I do die trying, set my body in the foyer as a warning to anyone planning on having kids. Ps. No your kid's not being bad at Thrive. Há alguém aqui que fala inglês? Have you ever been to a party where you didn't know anyone? That doesn't happen to me very often. Last night however, I went to a party where I encountered something of a similar nature. I went to a party where I couldn't understand anyone. Everything was in Portuguese. Now, this shouldn't have been a surprise considering it was a Brazilian party. Side note, I think I would like Brazilian music a lot better if it were in English. (But then again I guess it wouldn't be Brazilian if it weren't in Portuguese. I regress.) Luckily for me as the night progressed the conversations and music gradually transitioned from Portuguese into English. (I think that transition happened because American guys realized there was a party full of Brazilian girls going on). This party had a lot of two things, dancing Brazilian girls and steak. I have one distinct memory that combines these two things. I was looking over at the grill where there was a hot steak waiting to be eaten. In front of the grill was a rather attractive girl dancing. As I sat there I kept thinking to myself, "She's blocking the steak. Ok, move a little to the right. Ok, good now, oh no she's back in front of the steak." I didn't want to push her out of the way but that was some good steak. Side note number two, quite a few people at the party thought I looked like this guy. Huh, who knew, I look Brazilian. Let me first preface this blog by saying I thought this weeks service at VWS was fantastic. However, I had a friend with me today who had a slightly different opinion. His name is Michael and he has been living on this planet for four years now. Before that he didn't exist because he is only four years old. I warned him that he probably wouldn't enjoy the service but he insisted. After the first song he looked up at me and said, "That was a good song, I liked it." But as soon as the second song started he looked back up and said with a look of dismay, "Another song?" After the third song he wanted to know if we were going to sing forever. Finally all of the songs were over and he asked "Are we going to watch a movie now?" When I told him that some guy was going to talk to us now he wasn't thrilled. During the short video clip he kept asking, "What's funny, what are you laughing at?" Eventually Michael fell asleep. I know a guy who once told me that he thought that we were doing church incorrectly. Everyone should be in the same service he said. Separating the parents and the children is the wrong way to do things. I told him, "Ok, I guess we will just have to eliminate adult church and all the adults can come to kids church." Ryan, Jon, I give today's service two thumbs up. Unfortunately my rating is negated by Michael's two thumbs down. Better luck next week. Today I had a revelation. I was walking through the grocery store when I noticed a couple of old ladies doing their shopping. The first lady must have been in her 70s and the other her 80s. "No, not that one. Get the big pack." The 80 year old said to her friend. After all, who wants a 12 pack of beer when you can get a 30 pack. As I walked away the 70 year old was putting the 30 pack in the cart while her older friend picked out the ice cream. Today, I discovered the secret of living a long life. 1) EAT WHAT YOU WANT: Sure, you can eat all the right foods but that's no fun. "Gertrude Baines... lived to be the world's oldest person (115) on a steady diet of crispy bacon, fried chicken and ice cream." Maria de Jesus (115) also loved eating ice cream and quite enjoyed Portuguese pudding. Mitoyo Kawate (114) was know for her love of custard. Mrs. Beaterman, the lady who lived in my basement as a kid (it was an apartment) lived to be 103, her favorite food, peppermints. I can still remember eating ice cream with my great grandmother who lived to be 100. Jeanne Calment lived to be 122 eating two pounds of chocolate a week. And why not, chocolate is delicious. Sarah DeRemer Knauss née Clark (119) would agree listing eating chocolate turtles and potato chips as one of her passions. Hendrikje van Andel-Schipper (115) gave this advice for living a long life, "keep breathing and eat pickled herring." Susie Gibson ate at O'Charlies every week until she was 115. Sure, some really old people eat healthy and that's ok too. The key is, they enjoy what they eat. Eating shouldn't be stressful. Food should be enjoyed. If not than your doing it wrong. 2) KEEP ACTIVE: You don't have to exercise, you just have to keep moving. Clemet (122) took up fencing at 88 and rode her bike until she was 100. She was however "neither athletic, nor fanatical about her health." She just kept moving. The famous comedian George Burns who died at the age of 100 walked a mile a day. Hendrikje (115) was quoted as saying that along with eating pickled herring every day you "must remain active." Even at 114 Yone Minagawa was still dancing in her wheel chair. Keep moving. 3) BE POSSITIVE: Pessimist die young. Just ask one, they'll tell you. Emiliano Mercado del Toro (115) said that his secret to long life was his sense of humor. Camille Loiseau (114) "was known right to the end of her life for her humor and flirtatiousness." Geroge Burns (100) put it this way, "If you ask me what is the single most important key to longevity, I would have to say it’ s avoiding worry, stress, and tension. And if you didn’t ask me, I’d still have to say it. Worry, stress, and tension are not only unpleasant but can shorten your life. My attitude is, if something is beyond your control, there is no point worrying about it. And if you can do something about it, then there is still nothing to worry about. " So, smile, tell a joke and enjoy life. 4) WIN THE LOTTERY: Ok, not the state lottery. That kills most people. I'm talking about the genetic lottery. Let's face it. Most of you won't live to be 100 because it's just not in your genes. If everyone related to you died at 53 than you had better make the best of your short life. I will however be living to be well over 100 and I will be eating bacon and ice cream all the way there. So bought a minivan. I have to admit, a mini van was not on my short list of desired vehicles. A motorcycle, yes, a small pickup truck, yes, a mini van, not so much. In case your not the observant type, single guys don't normally drive mini vans. If I was a soccer mom with 4 kids I would a shoe in for the minivan club. I would get decals with my kids names on them and bumper stickers proclaiming how much smarter my kids are than yours. I'm not a soccer mom though, I'm a bachelor and mini vans are not conducive to the bachelor life style. Luckily for me I have no idea what that life style is. I've been shoving 6-8 kids in my Dodge Neon every week for church. The car is only made to fit 5 so that's a bit of a stretch. If it was up to the kids we would probably have 10 kids in the car and two in the trunk. I should clarify who these kids are. A lot of people get confused and think that I have somehow fathered an entire village. The kids are my neighbors. They call me their uncle, a title I haply accept. Yea, I got a minivan. I guess somethings in life are more important than looking cool. I found the minivan on craigslist. 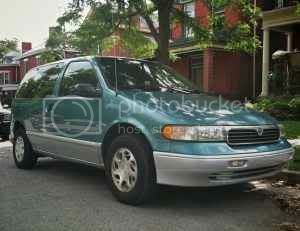 It's a 1998 Mercury Villager and blue books for $2,925. The guy was asking $1,800 but had just dropped the price to $1,400. I talked him down to $1,300. He was leaving the country and needed the cash. (Side story, he had prayed that morning that the vehicle would hurry up and sell. As an act of faith he tithed $130 that morning. He is a music guy at the big Vineyard so we have mutual friends. Somehow he knows these two guys. When I told him my name he said that he recognized it. He wasn't sure how or why but somehow he knew who I was. My guess he reads this guys blog) The vehicle has automatic everything. The drivers seat can adjust in 4 different ways. The van will be my second vehicle. I will continue to drive my Neon during the week. I will drive the van when I go to church, need to haul stuff around and when I am cruzzin the streets looking for single soccer moms. I would never play a game of chicken because I would kill you and me both. I don't bluff. If I say that I'm going going to hit you in a head on collision unless you move, you had better move. And if I say that I'm going to eat your ice cream, I'm going to eat your ice cream. I don't care if your only 3. 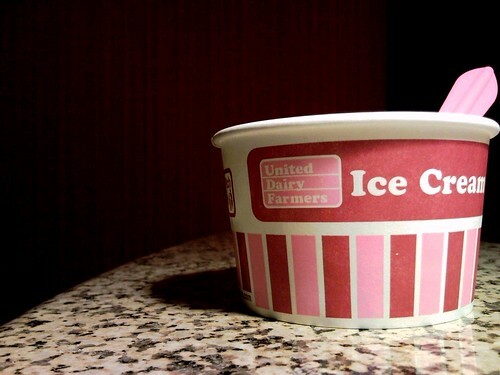 Yep, I ate a 3 year old's UDF ice cream sunday tonight and it was good. It was brownie, chocolate fudge, whipped cream, with a cherry on top. After getting her the Sunday of her choice she decided that she wanted flaming hots instead. Problem is, that was not one of the options. So, I made her a deal, she could eat her sunday or I could eat her sunday. Every few bites I would show her how much ice cream was left and invite her to have a seat and eat the rest. She laid on the floor and wined that I was eating all her ice cream and guess what, I was and it was good. She ate the cherry and I ate the rest. I don't bluff. I know a lot of people, probably a thousand or two or three (I'm just making those numbers up) For Christmas one year my sister bought me a shirt that said "People know me" because she said it was fitting. Her theory is that if everyone in Cincinnati either knows me or knows someone who knows me (That's her theory not mine). My mom said if she had something strange about her (referring to my hair) people would remember her too. My mom's obviously the caring sensitive type. (She later partially recanted that statement when she realized it was mean and only partially true) I enjoy knowing tons of people. It's very handy at parties. Today I had a friend who wanted to introduce me to his pastor. He did and guess what his pastor said? "We've met before." Tonight I went to pick up something that I bought off of eBay and ended up talking to the sellers for over an hour. As it turns out I met the guys brother last week when I bought some paintings off of him. Ok, so now I bet your wondering, "How can I know lots of people?" I'm glad you asked. I've written the following set of instructions just for you. 2) Repeat step one lots and lots of times. See, that was easy. Now you can say things like, "I know a guy who knows Shaq," or "I once met the guy who holds the world record for selling the world's most expensive poker chip." Now go out there and meet some strangers.